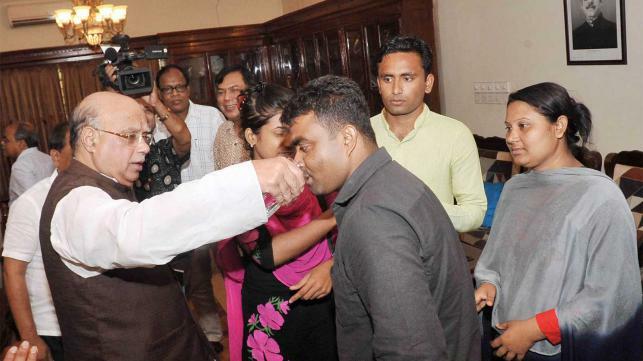 Bangladesh vice-president of the Society Mukul Hossain told UNB basic graduate nurse that he was in the past as assured to call the nurse of his Health Minister Mohammad Nasim as the batch-wise and in seniority will be decided. Bangladesh Diploma met in the morning on a five-member delegation (Bekar) Nurses Association and Bangladesh basic graduate nurse Society Minister Dhanmondi residence of Syed Surinder senior information officer Chaudhry, the Ministry of unemployed. Nurse delegation meeting Naseem said that the ministry will consider their demands to the basis of humanity, told me. Several hundred nurses Public Service Commission (PSC) for round 3.616 senior nurse recruitment examination were demonstrations across the country on March 28 after staging released. Demand, rather than any entry test 10,000 new posts including the seniority of public hospitals to recruit nurses nurse and 3,728 as soon as possible to fill the vacant and nurse a diploma degree and the remaining 11 per 89 per cent with the nurse percent BSc nursing degree as in the vacant post.